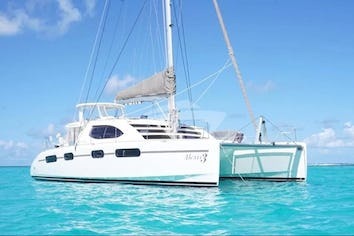 Pisces is a 47' Leopard Catamaran that specializes in fully customized luxury crewed charter vacations. She has a great history of facilitating fantastic charter in the US and British Virgin Islands. She boasts in performance quality sailing capability, while keeping her clients in ample style and comfort. In 2018, SY Pisces went through extensive renovations and upgrades including new, ultra quiet Northern generator, new 13' center console Achilles tender, new JBL sound system and upgraded utensils, cushions, sheets and towels throughout. Literally, SY Pisces is as good as new. Now based out of Yacht Haven Grande! ***(Rate divided by 6N X number of nights*** For 6 nights divide rate by 7 X6N. SY Pisces organizes Rendesvouz dives for our guests. Price varies depending on number of divers and location. Please call for pricing. For Instructors and PADI certified divers, we can arrange to have all equipment on board for our guests. First arriving in the Virgin Islands in the year 2000, Marc fell in love with the beautiful beaches, bays and boating life; he embarked on a yearlong adventure in the Virgin Islands as an avid explorer of finding places, “off the beaten path”. He immersed himself in the local cultures of both the US and British Virgin Islands and learned many of the unique aspects of waters in and around the islands. Knowing he could use his finding in the future, he returned to the cold waters in the States. Originally from Kansas, for the past twenty years Marc has sailed throughout the Pacific Northwest, including Portland, Oregon, Seattle, the Puget Sound, British Columbia and Southeast Alaska and finally on to the beautiful Caribbean waters. While living and sailing in the Chesapeake Bay area, Marc seized the opportunity to take on new quest by sailing his boat from Annapolis, Maryland to Bermuda and then on to the Virgin Islands in 2011, where he set his anchor and made St. John, USVI his home. Marc has continued to explore the US and British Virgin Islands extensively, revisiting the places he found many years prior, rekindling old relationships with locals, and finding the most beautiful beaches, amazing snorkeling and SCUBA diving reefs, along with finding vibrant island culture to share with his guests’. While Marc has been working as a Charter Captain for years in the Virgin Islands, he has shared his love of sailing with others by volunteering in local youth sailing programs on both dinghies and performance monohulls in the Caribbean and in the Pacific Northwest. 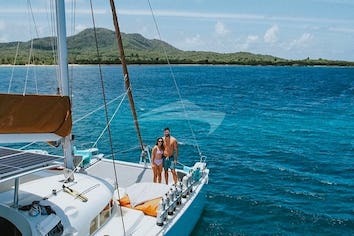 Marc is excited to help bring new and exciting voyages in the Caribbean to others and share his love of the islands and its wonderful sailing opportunities aboard S/Y Pisces. Qualifications and Credentials. USCG Captain, Master 100 Ton Near Coastal Sail and Tow Endorsement, STCW, MROP, Helm, TWIC. PADI certified. Captain School, 2011, St Thomas, Virgin Islands Helm Management Certified, 2016 USCG Auxiliary Coastal Navigation, 2008 Zingtrain Management Training, 2007 Bachelor of Science in Psychology, Kansas State University. 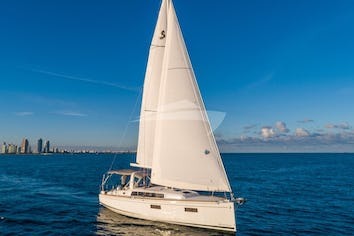 Your First Mate and Chef, Chelsi Reed, will greet you warmly aboard the Sailing Yacht Pisces with a chilled cocktail, warmed towel and brilliant smile. She will assist you putting away your luggage before you and your group set sail into the Caribbean waters. Chelsi, while not born in St. Thomas has lived on island since she was twelve. She began working with her family aboard day charter boats and quickly fell in love with everything the ocean has to offer. She has been a certified SCUBA diver for over twelve years; her knowledge of the British and US Virgin Islands is stellar. She knows many of the honey-holes filled with tropical fish along with some of the turtles and sting rays favorite dining spots. She will show you some of the most beautiful under sea life the waters have to offer. Chelsi studied in university to achieve her degree in Child Psychology, but St. Thomas called her back home to continue her career on the water. She spent several years working in the back of the house of restaurants and catering companies, honing her culinary skills. She has an innate skill in creating delicious and healthy dishes aboard S/Y Pisces as well as a talent for concocting smooth, tasty drinks for all aboard! You’ll certainly enjoy your time aboard with Chelsi as her personality and humor with captivate you while aboard on your perfect vacation. Chelsi is a certified PADI Open Water Diver and has her STCW certification.